You can do lot more on Facebook besides sending messages and posting photos. 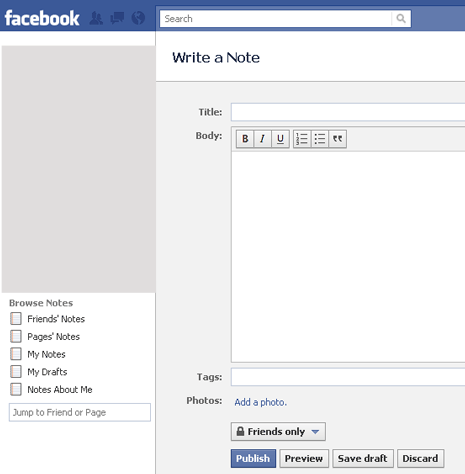 You can ask questions to Facebook friends and even write detailed notes for them using Notes application. Note can be written to describe any personal experience, story or incident. It can be neatly formatted with relevant photos. 1. Login into Facebook account to access Notes application. 2. On the left sidebar, click ‘More’ and then click ‘Notes’ to access Notes application. 3. It will show notes from your Facebook friends. Click ‘write a note’ button at top right to start writing a new note. 4. Rich text editor will load that allows you to write note with ease. Type the title and body text. You can use formatting toolbar to bold, italics, underline and position text. 5. You can also add photo to your note by clicking ‘add a photo’ button at the bottom. You can select either of uploaded photo from your Facebook profile. 6. At the bottom you can click to select facebook friends who can see your note. 7. Click ‘publish’ to post the note or click ‘save draft’ for future editing and posting.